I completely frogged the grey Goodwill sweater I bought last week and I ended up with 3 balls of yarn that I needed to skein for dyeing. 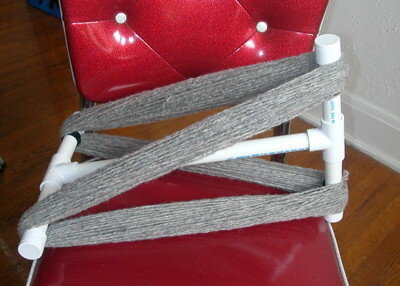 I have been thinking about buying a niddy noddy, but the adjustable niddy noddies run around $50 and I am not comfortable committing to just one size so I needed an inexpensive way to make an adjustable model to measure and skein the yarn that I want to dye. I started by looking at dowel rods, but ended up in the plumbing section with the PVC piping and the huge selection of connectors. For under $3 I got everything I needed for my niddy noddy, plus I can adjust the skein length to coordinate with my needs. 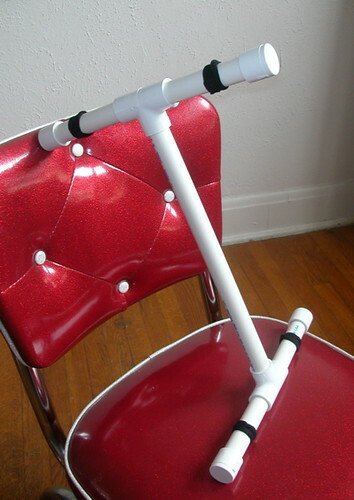 First, you will need .5" piping (FYI- PVC piping is measured by the internal opening size, not the pipe width.) 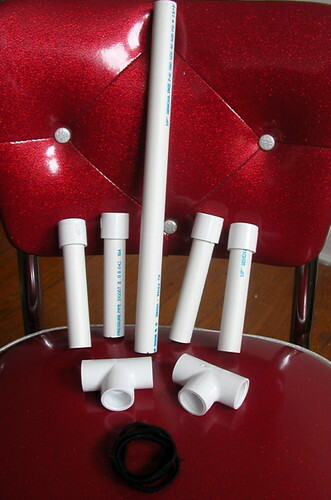 PVC piping is often sold in 10' sections so you will need to find someone to cut it down for you. For a 60" skein you will need the piping cut into four 4.5" pieces and one 12.25" piece. You will also want to grab two .5" slip tee connectors, four .5" slip end caps, and four o-rings to fit snugly on the pipe. I didn't buy the o-rings, but when the yarn started slipping around I realized that I needed something to create a groove. On my niddy I am using hair ties where you would put the 0-rings. Try out all of your pieces in the hardware store to make sure they all fit together before you buy everything. To change your skein length you simply pull out the center pipe and replace it with one in the size you want. I haven't done the calculations for the other niddy noddy sizes yet, but I will post them when I do. I found directions for using a niddy noddy on the Joy of Hand Spinning Web site along with tons of other tutorials on spinning yarn. It was a little awkward to use at first, but once I figured out how to hold it everything went faster. Here is my first skein from the Goodwill sweater. It looks like you haven't been here a while, but i would like to thank you for posting instructions on making the niddy noddy. I will be going to Home Depot tomorrow to get the materials. Thanks for your help. Hope to read your latest works soon! This is awesome! I made two PVC niddy noddies over the weekend following your instructions (one large, one small) and it cost me $5.27 CDN in total. Fantastic.